Finally, you can sacrifice your friends and summon an Ancient Horror in the new Dark Young expansion for the Halloween party game Fhtagn! PRETORIA, GL, SOUTH AFRICA, October 23, 2018 /EINPresswire.com/ -- With the Halloween season in full swing, celebrate the most frightful of holidays with an indie game that will both chill and tickle your funny bone! On 22 October 2018, Design Imps launched a new expansion (the Dark Young) for their game Fhtagn! - Tales of the Creeping Madness. 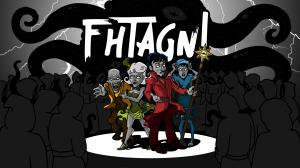 Dubbed the "funniest take on mystic doomsday cults in years", Fhtagn! is a choose-your-own-adventure game where you can play as one of four cultists intent on destroying the world by summoning an Ancient Horror. Decide how you will be preparing for the final ritual by visiting various locations in the unsuspecting town of Arkham and navigating iconic Lovecraftian events. Battle investigators, gangs, corrupt cops and horrors from the Depths to bring about the end of the world! •	Across 113 events with 370 potential story outcomes. •	Fulfil 1 of 24 roles with 56 role feedback stories. •	142 different character endings. In its first instalment, this party/boardgame-esque game saw the cult of The Dreaming Eye trying wake the thing of the idols, that green, sticky spawn of the stars (can you guess who?) to claim the world. Now, there is a new cult in town – The Thousand Young. These sycophantic backstabbers are devoted to the All-Mother and Mother only wants the best and the brightest. You have 6 rounds to build up the required stats needed to use the ritual items in the final ritual, but you also need to outwit your “friends” and make sure it is them on the chopping block and not you. For every successful round you complete, you get ‘Not It’ stacks, which you use in the end of the game to determine who will be sacrificed to dear Mother. 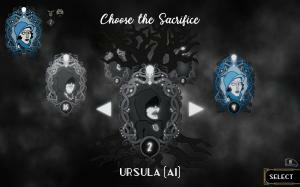 The player who receives the most votes will become the juicy glazed ham on the altar in the Dark Forest. Or will they? Should you be voted as the sacrifice, you will have the chance to escape and GTFO outta there! If Fhtagn!’s stories aren’t scary enough for you this Halloween, you can write your own stories for the game! The Steam version of the game has a Content Creator feature where you can create your own stories and play it with your friends. All that is needed is a story idea and no programming is required. It is a modern take on the classic creepy campfire stories where you can frighten the living daylights out of your friends. Who remembers telling creepy stories like The Licked Hand, The Attack of the Hook-man or The Vanishing Hitchhiker? We’re sure you can do better this year with your own mad creation, by using the Fhtagn! Content Creator. The game shines in local co-op or screen-share with friends and it is a casual game that will provide loads of entertainment. 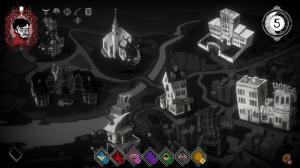 With snazzy graphics, betrayal is best served with a jazzy/swing soundtrack and neo-noir visuals. Don’t miss out on this thrilling experience get your copy on the Steam Store Page or Itch.io!